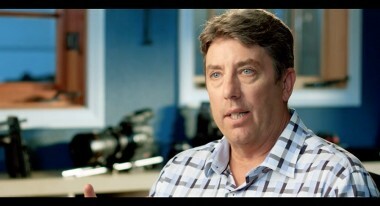 I first saw cinematographer Shane Hurlbut speaking at a trade show held in New York City in 2010 hosted by Canon. Hurlbut had just finished shooting Act of Valor, shot predominately using the Canon 5D Mark II, and he burst on stage with enough energy to power the building. At the time I wrote that he was “loud, in your face, cracking jokes while dashing about the stage,” but it was also clear he had a passion both for the gear and for sharing information. Since then Hurlbut has lensed the pictures Deadfall, Need for Speed, and the currently in post-production Fathers and Daughters. He’s also become well known for a blog that’s full of tips and gear reviews. Continuing these educational efforts, Hurlbut is about to begin “The Illumination Experience Educational Tour,” a series of one day training events held throughout the country. I recently spoke to Hurlbut about the goals of the tour, which will be discussed in part 2 of this interview, but first I asked him how he evaluated cameras and how he worked with directors to create the look of a movie. Along the way he dismissed 4K and laboratory testing and bemoaned the “flat” look of modern lenses. Filmmaker: You wrote a very popular blog series evaluating the ARRI Alexa and Canon C500. How do you go about testing a camera? Hurlbut: What I try to do is put the camera in the situations that you are going to be shooting in. Putting it into a lab scenario, in all those devices they’ve created to measure latitude and all this stuff, it’s all a bunch of crap, because when you get out there on the day it doesn’t matter what the latitude is. What matters is how it looks when it blows out a window, or how the street lights react at night, because those are the situations you’re in. You’re not in a lab. We went down the road of systematically creating all these specific tests that were going to be how we were going to be using this camera. We knew we were going to be shooting late afternoon, we knew we were going to be shooting in overcast situations as well as in very bright sunny situations, as well as very noisy situations where we had to go really high with the ISO. We did latitude tests, over-exposing and under-exposing the sensor. We did IR tests, which have become a huge thing right now with all these digital cameras, because some sensor manufacturers put the IR filter on the sensor, and some don’t, or they do a very minimal job of it because they don’t want to worry about de-focusing the image. You have to test that and find the right recipe for the IR filtration. I think we had a series of 11 different tests that we put each camera through to be able to figure out what the pros are, what the cons are, and then a way to systematically push the cons down and really accent the power of the pros. Basically exploiting each camera for its best abilities is what we try do. Filmmaker: One variable when evaluating cameras is the lens. How do you go about evaluating the lens? Hurlbut: You pick the lens that is going to be best for the story. In our case, the Panavision Primos were what we were hoping to be shooting Need for Speed with. Then, when it was all said and done, Panavision pulled out and I had to go to Cooke. What I eventually found with even more testing is that it was the greatest thing that could have happened; the Cookes just looked absolutely incredible and lenses are a whole part of the equation, absolutely. But in regards to the camera test, the lens isn’t a huge part of the equation. You’re really looking for the sensor type that’s going to be, let’s say, your brush and then from that, you decide what lens that is going to be able to tell the story the best. In Fathers and Daughters I was on this mission to [differentiate the time periods]. Russell Crowe is 1989; I [thought that I’d] shoot that with the Cooke S4 Prime because that’s older lens technology, right? They’re made by hand and are a little creamier. The way they handle flares is not as good as the Leica Summicron-C lenses that are just out and are engineered by a computer to be flat and crisp and all that stuff. I thought that would be the perfect juxtaposition to be able to tell the story of 2014 versus 1989. Well, when I got in to the whole testing process of these lenses side by side, we found that the Leicas were awful to tell the story, because they created such a flat feel and the crispness was nice, but the flatness and the very one-dimensional quality that Leica had engineered was not going to be beneficial for the story. We ended up shooting Cooke for everything, and then just doing a little color grading to separate 1989 from 2014. Filmmaker: When you say it looked flat, what is it that seemed flat? Hurlbut: Well everyone wants to design these things in a way that not only are they able to deliver 4K, which, who cares? The other thing is, they want to deliver the flattest plane. For some reason in the minds of lens makers, distortion has become the enemy, when it’s the only thing that actually gives a lens personality. They are making these lenses, trying to be as flat as possible, and the highest resolution possible, and I feel they’re kind of missing the point. Stanley Kubrick did it on Zeiss Ultra Primes and they’re the most amazing movies. Spielberg has done it with all these older lenses. Distortion is your friend. Why now, all of a sudden, are we saying, “make everything flat”? Why are we going down that road? Well it’s pretty simple: the flat lenses look really great on sheet metal, but they don’t look really awesome on a face. Filmmaker: You said “who cares about 4K?” You don’t like 4K? Hurlbut: Well, a sharper lens is not necessarily the right recipe. The 2K resolution is absolutely perfect for what we are doing. I think the sharper you get, the more “video” and the more unrealistic it gets. I think everyone still has this mindset of what film is, and the feel of it, and the look of it, and I think for so long we’ve held all these digital cameras to that high standard. Even when the first HD cameras came out I wasn’t shooting with any sharp glass. I was going down to the old Ultra Speeds and everything that was from the ’50s and ’70s. Filmmaker: When you are starting a movie, how do you go about figuring out the look of the movie? Hurlbut: The director sits down and we design the whole look of the movie. He tells me what the emotional content feels like, what the characters are going through. Reading the script, I create what we call an emotional breakdown where I break down the emotions of each character through out the film, and then I texture the lighting and the camera emotion to accent and amplify those emotions. With Need for Speed, Scotty Waugh wanted it to feel very realistic. He didn’t want it to feel like The Fast and the Furious with a very CGI world and unrealistic stunts. He wanted it to feel real and grounded. When we did the camera sensor tests we found that the Canon C500 felt the most real, the most alive. We knew we had a lot of night work and we wanted to pick a camera that could do the full spectrum. We also had a budgetary crunch where he had a very big vision but we had to be able to fit it within our budgetary box. I could not be flying Condors and Bebee lights to light four and a half miles of street racing at night. I had to be able to do it with 10 or 12 lights and four or five electricians. And we had to find a sensor that could enable us to pull from the practical side of Georgia Water and Power, instead of from the budgetary side of Dreamworks, and it worked out incredibly well. So it’s taking the notes from the director, and systematically putting it in to a look and a feel and a mood and a tone. He wanted it to feel very rich, he didn’t want to make a desaturated world. He wanted their skin to have vitality and life, and really show that age and the youth of Aaron Paul and the group around him. The C500 also fell in beautifully with that, because that camera’s sensor is pretty close to being the most filmic of all the sensors that are out there. It sees subtle colors that a lot of the other cameras don’t tend to see, and then you can take those subtle colors and you can either energize them or you can make them subdued or mundane like a CLog camera would see them. In the color correction bay you could really see the difference in color grading the Alexa vs the C500. The Alexa required a lot of work and color correction and the C500 fell in every single time beautifully.